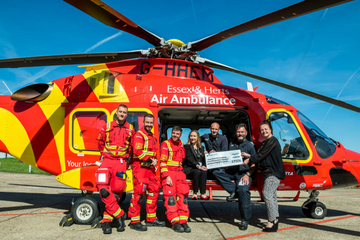 Essex & Herts Air Ambulance Trust (EHAAT), unlike NHS emergency services, is a Charity providing a free life-saving pre-hospital Helicopter Emergency Medical Service (HEMS) to the people of Essex, Hertfordshire and surrounding areas. At EHAAT we take the protection of our supporters’ personal information seriously and we are committed to ensuring that we are completely transparent about why we need the personal information we request when you support us and how we will use it. This policy relates to our use of any personal information we collect from you through our website or that you provide us by email, in letters, by phone, SMS, in other correspondence and in person. We will also explain your rights about your information and how we look after it while we have it. Or by email: [email protected] or by phone 0345 2417 690. The information that we collect about you may vary based on how you have chosen to support EHAAT. Your name and address so we know who you are and how to contact you. Contact information such as telephone numbers and email addresses so we can keep in touch with you. Your bank account or financial details if you take part in the Flight for Life Lottery, our raffles or make a regular donations to us via direct debit or standing order. We only collect information about you that we need to make sure your donation, event registration etc. is processed correctly and that it is recorded accurately so that we can enter you into out lottery or raffle or contact you about our work. We respect your privacy and we try to minimise what we do collect. The Data Protection law recognises that certain categories of personal information are more sensitive. This is known as sensitive personal data, or special catergories of data, and covers health information, race, religious beliefs and political opinions. We do not usually collect ‘sensitive’ personal data about our supporters unless there is a clear reason for doing so such as providing appropriate facilities or support to enable you to participate in an event. When we do collect this type of information we will tell you why we are collecting it and how we will use it. For example when you donate to us, sign up to be a volunteer, register for an event or sign up to the Flight for Life Lottery. When you visit, donate or place an order via our website you may be asked to provide information about yourself. We may also collect information about your usage on our site. • to comply with any legal obligations we may have, for example to claim Gift Aid, or to adhere to the social responsibility elements of the Gambling Act. • to manage our recruitment and staff administration. We use third party suppliers known as ‘data processors’ to process data on our behalf e.g. to send out mailings such as the Flight for Life Magazine. When we use such suppliers we ensure that they are under a contractual obligation to only use your information in accordance with our instructions and for no other purpose. We will ensure that your data is transferred safely and securely and that the data processors agree to process your data in such a way as to be compliant will all Data Protection legislation. We take appropriate care to secure the information we hold about you. We have robust technical security such as passwords and information encryption. We will use publically available sources to ensure that the information we hold is accurate and up to date. For example, where you have signed up for a postal redirection service, we will use the Post Office’s National Change of Address database to keep in touch. We may use other services to cross-check the accuracy of the contact details we hold for you. You can find out more about how we use the information we gather through our website by looking at our online privacy statement here. You can object to our processing of your personal information where we are relying on a legitimate interest (or those of a third party) and there is something about your particular situation which makes you want to object to processing on this ground. You also have the right to object where we are processing your personal information for direct marketing purposes. Please contact us providing details of your objection. You have the right to stop us sending marketing materials to you. You can choose to stop receiving our marketing communications at any time. You can update your preferences via our website www.ehaat.org/keepintouch, by phone 0345 2417 690. What we do if you choose to tell us about your experience as a patient of EHAAT? If you share your story with us we will seek your consent before using it in any way. We will communicate with you at the time you share your story as to how we intend to use your information and ensure that you are happy with the story before it is published. If you have any complaints about how we handle your personal data, please contact us so we can resolve the issue, where possible. Read more about how to make a complaint. This statement was last updated on 22 June 2018.